"The Weather Channel is an American basic cable and satellite television channel which broadcasts weather forecasts and weather-related news and analyses, along with documentaries and entertainment programming related to weather. Launched on May 2, 1982, the channel broadcasts weather forecasts and weather-related news and analysis, along with documentaries and entertainment programming related to weather." 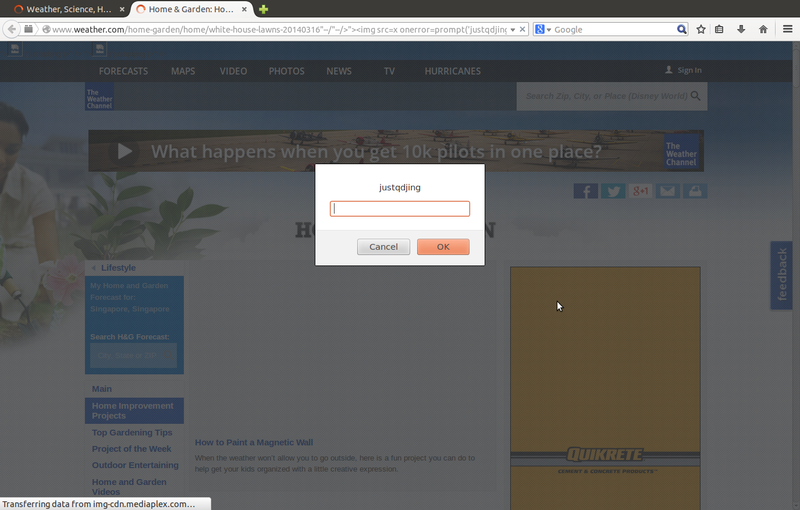 Almost all links under the domain weather.com are vulnerable to XSS attacks. 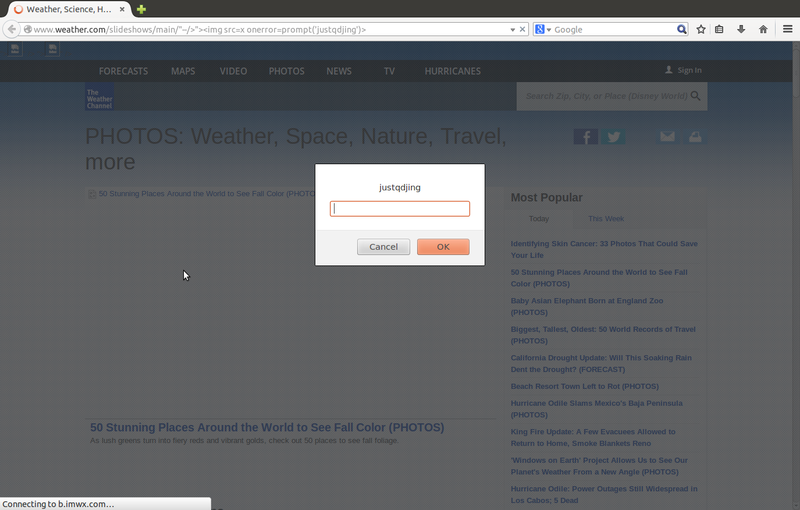 Attackers just need to add script at the end of The Weather Channel's URLs. Then the scripts will be executed. The Weather Channel has patched this Vulnerability in late November, 2014 (last Week). "The Full Disclosure mailing list is a public forum for detailed discussion of vulnerabilities and exploitation techniques, as well as tools, papers, news, and events of interest to the community. FD differs from other security lists in its open nature and support for researchers' right to decide how to disclose their own discovered bugs. The full disclosure movement has been credited with forcing vendors to better secure their products and to publicly acknowledge and fix flaws rather than hide them. Vendor legal intimidation and censorship attempts are not tolerated here!" A great many of the fllowing web securities have been published here, Buffer overflow, HTTP Response Splitting (CRLF), CMD Injection, SQL injection, Phishing, Cross-site scripting, CSRF, Cyber-attack, Unvalidated Redirects and Forwards, Information Leakage, Denial of Service, File Inclusion, Weak Encryption, Privilege Escalation, Directory Traversal, HTML Injection, Spam. This bug was published at The Full Disclosure in November, 2014.